This chart speaks volumes when you look at the relative market share for Starbucks, then look at their ad spend. John Moore points out the reason, which bears out the promise of Tara’s marketing philosophy – pinkomarketing. It’s just one more reminder that Starbucks spends its advertising dollars on making better products and better customer experiences and not on making funnier television commercials. 1) While there may be some competition for the coffee market between a McDonald’s and a Starbucks, comparing the Mickey D’s market share against Starbucks is questionable. the appropriate comparison of Starbuck’s ad spend should be its direct competitors. 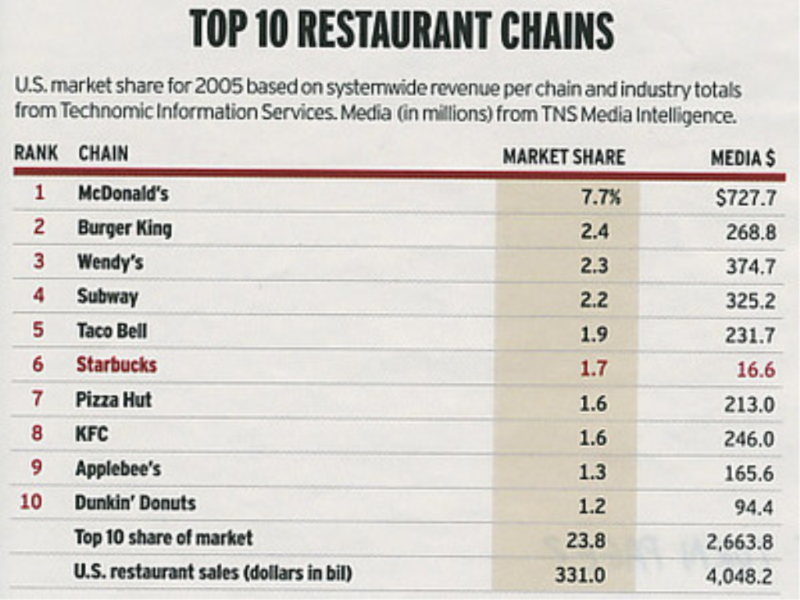 2) Even if you ignore flaw #1, then what was Starbucks’ market share for 2004? If it was 2.3%, then would its seemingly measly ad expenditure seem defensible? 3) I wouldn’t argue that Starbucks delivers a better customer experience (and perhaps better quality product) than its competitors. But for Mr. Moore’s assertion to be defensible, I would want some measure of the firm’s customer experience ratings, and see proof that indeed, that the ratings INCREASED over the prior time period. Assume for a moment that it went down from 2004 to 2005 — would Mr. Moore still be able to contend that Starbucks was spending money on improving customer experiences rather than advertising? No. Ron … Fair enough points … the only contention I could see there, is that focus on product and service quality is a valid alternative to high media spend, and that customers appreciate it. Rshevlin … I’m not sure I follow your logic. The entire customer experience from the wait in line to the Starbucks language ordering process to the music overhead to the beverage hand-off spot to the first sip to the conversation with friends while lounging in comfy chair to holding the white iconic logo’d cup — that’s the customer experience I’m talking about. Starbucks has “baked” marketing into its business because the whole customer experience IS the advertising. Customer experience ratings don’t matter here. The fact is Starbucks spends more dollars on sourcing coffee beans than it does on advertising. The fact is Starbucks spends more dollars on hiring/training in-store baristas than it does on advertising. The fact is Starbucks spends more dollars on store leases than it does on advertising. All of those cost expenditures are part of the customer experience Starbucks delivers. Dig? John …. I love that statement – “the whole customer experience IS the advertising”. Thats it, and nothing can say it better! My argument isn’t about the relative impact of spending one’s funds on media ads vs. customer experience. It’s about the context with which Starbucks’ ad $ are being presented. Comparing Starbucks to McDonalds and Taco Bell is not an apples-to-apples comparison. And I stand by my points in #3. Where’s the data that says that Starbucks’ customer experience is getting better? (I’m not doubting that its better than its competition — which is not Taco Bell or Wendy’s). But you said that Starbucks spends its ad dollars on “better customer experiences”. I interpreted that to mean that RATHER than spending their money on advertising, they spent it on better customer experiences. I don’t know where you live, Mr. Moore, but in my neck of the woods here in the Boston area, the lines at Starbucks are excessively long, there are no “comfy” chairs available to “lounge” in, and quite frankly, I don’t believe for a moment that I’m the only one getting fed up for paying excessively high prices for a product where the experience isn’t living up to what it used to be. Is Starbucks foolishly spending its money on advertising? No. But you offered NO proof that the money it IS spending is improving the product or the customer experience. rshevlin … first, you can call me John … second, you are taking this far too analytically. My point is simply that Starbucks views its marketing dollars in a different way. They would rather spend their marketing dollars on building out stores and not on airing commercials. That’s my point. When you consider how other QSRs go about spending millions of dollars on media advertising, it is interesting to note that Starbucks’ success doesn’t rely on spending it marketing dollars on media advertising. Starbucks has a great Marketing Strategy … and so does McDonalds! and Burger King and Wendy’s. I don’t think that the table above provides more information that what it shows: the relative market share of the different QSR. As someone who lives in one of the few cities in the civilised world not (yet) totally over-run by Starbucks – the closest branch is literally over 3,000 kilometers way – I would have to agree. You go to Starbucks and you know what you are going to get. I travel around Asia a lot and you can go into any branch and get a decent coffee. Not a truly great coffee, but a good, decent coffee and with any options you might want. To me, McDonald’s relies on ad spend as they continuously need to get in new customers – kids grow up. Starbucks do not need to spend big, provided they satisfy their customers, they come back.